Affinity for gold to save the day? With a ‘Hard Brexit’ looking more likely and Trump’s inauguration this week, 2017 is well and truly under way. What we expect the year to hold is probably not even half of what it really will. But from what we know, the upcoming French and German elections, referendums, geopolitical crises, steps towards reverse globalisation and a third of global government debt yielding negative interest rates, governments are already prompting central banks and investors to turn to the one asset that has survived millennia of financial and monetary crises. 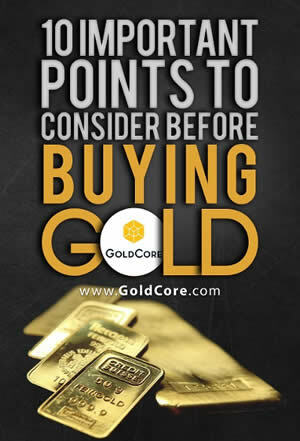 One that is highly liquid and convertible into other currencies – gold. Whilst mining output remains relatively flat and we are at peak gold, Western central banks have stopped gold sales, large emerging market economies continue to increase their gold reserves. China, Russia (both top gold purchasers in 2016) and now Turkey, are the notable players. As a result, in December 2016 imports reached 36.7 tonnes, significantly more than the 4.65 tonnes seen in the same month in 2015. This accounted for more than one-third of the country’s annual imports of 106.2 tonnes, more than double 48.7 tonnes in 2015. Before 1993, the Turkish gold market was not fully liberalised, since then the World Gold Council reports that they have seen ‘rapid growth of the sector’ and this is across all areas relevant to the physical gold market. Encouragement to buy gold from the likes of Prime Minister Erdogan, who is very popular with huge swathes of the electorate, is not just a selfless act to protect citizens’ wealth during uncertain times in Turkey, the Middle East and across the globe. There are several factors at play here. These factors should be considered with Turkey’s unique role in the global gold market, in mind. There is no country positioned in such a way (both geographically and politically) that plays all three major roles of producer, buyer and conduit, in the world of gold. Since 1950 the country has experienced at least one economic crisis per decade and today it is no secret that Turkey is struggling under both economic and political pressures. Along with heightened security concerns that have damaged the much relied-upon tourism sector, economic growth is sluggish, inflation is rising and a strong US dollar is not helping matters. Despite this, Erdogan has recently tried to prevent the central bank from increasing interest rates. All measures since taken by the central bank in order to boost liquidity in the system have lead to short-lived spikes in the Turkish lira. The Fitch-rating review on the 27th January is expected to downgrade the country’s credit rating to +BBB, something not even the failed coup made happen. The push for support for gold is two-fold, first it is an attempt to boost trust in the central banking system which is in increasingly dire straights, the second is to support the underlying currency which is central to the ‘axis of gold’ (h/t Jim Rickards) that is Russia, China, Turkey and Iran. Both of these things push back against US dollar hegemony. Gold to save the day? Turkey’s citizens have long had an affinity to hold physical gold. It is rarely seen as an investment, few look at it as something that they will receive a return on. Instead it is a necessity and something that families hold for wealth preservation and as insurance. Therefore, it was not unusual for citizens to act on the PM’s exhortation to buy gold when Erdogan made his statement in December. Gold is bought for insurance, rather than investment, and Erdogan has recognised this. The fall in the lira has meant a slump in demand in recent years, but this has changed recently. Whilst Trump’s victory saw the Turkish lira plummet further, it also drove up gold demand. A move which has been termed the ‘Fear Trade’ by Frank Holmes. Then Erdogan’s calls for citizens to buy gold not only boosted imports but also helped to give some respite to the currency’s fall. As a result, the Turkish lira has found some support. This may seem a little contradictory given the idea that gold will save the Turkish lira when citizens buy gold. If the gold has to be imported this puts further pressure on the currency and widens the trade deficit. However, it may be that the majority of recycled gold is bought domestically, which accounts for a large proportion of gold purchases. The title of this section is misleading. Usually when we talk about central bank gold demand we are referring to how much the central bank has purchased for its own reserves. However, when it comes to Turkish central bank demand they don’t so much need to purchase gold, they just amend policy in order to accumulate others’ holdings and therefore demand more of the yellow metal. This is because in 2012 the Turkish central bank increased the amount of gold commercial banks could hold as reserves to meet their reserve liability requirements, to 20%. Any form of gold was accepted as collateral. The government were looking to mobilise ‘under the pillow gold’. Banks were also told that gold reserves could not count towards foreign currency liabilities. It took until just 2014 for the central bank’s reserves to climb by 350% from 2011’s figures and saw gold become the top investment option amongst Turkish citizens’, ahead of real estate. A central bank paper written in 2014 stated, “the new policy framework… has been successful in achieving a soft landing in the economy and lessening the financial stability risks”. Since the liberalisation of the Turkish gold market, local banks have offered gold accounts for its citizens, however as of 2012 much of the privately held gold was outside of the banking system. Estimates vary as to how much is privately held, ranging from 3,500t to 5,000t. The government has, since 2011 tried a number of routes and incentives to encourage citizens to get their gold into the banking system, this is part of the drive to reduce the risk of a liquidity crisis. The move was seen as such a success that Central Bank governor Erdem Basci was awarded the Banker’s 2012 ‘Central Banker of the Year award’. 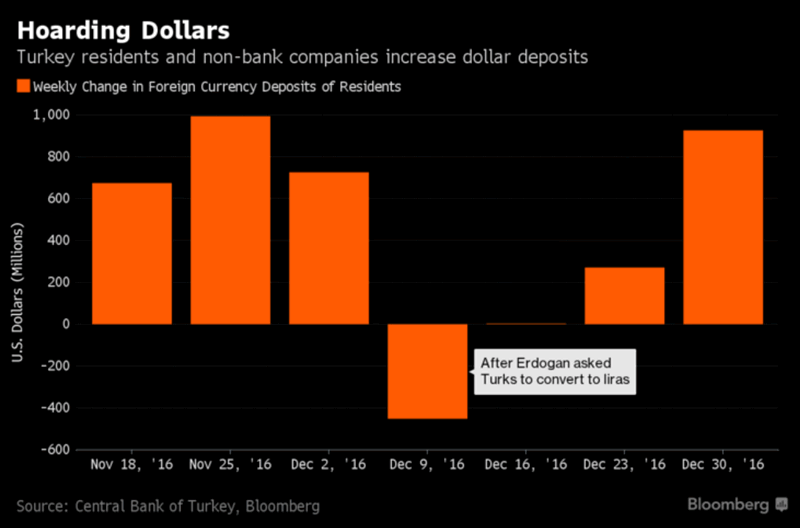 Interestingly, we should note that despite Erdogan’s calls to support the lira and gold (and subsequent increases in gold imports) US dollar deposits by Turkish residents and non-bank companies rose for a third week, last week. Gold is harder for citizens to move out of the financial system, the view is likely to be that when the time comes citizens will struggle to get deposits out of the system and instead they can be used to support the currency and the banking system. The move to bring gold into the banking system is likely a move to prevent a situation whereby banks are unable to meet creditors’ demand for repayment – a liquidity crisis. This is something the country has been working to avoid since the 2000/2001 liquidity crisis in Turkey. However, it became something that looked like happening again in 2011. The increase in gold reserves is also likely to be designed to counteract any leaps in domestic gold demand by providing a liquidity pool, so as to try and reduce the need to import gold and weaken the lira. However, this would leave banks wide open to a run, should depositors demand their gold back, en masse. Not impossible to imagine that their gold might not be so easy to get at in such a situation and a reason that Turkish people should keep some of their gold in secure storage in vaults internationally. Arguably the country doesn’t need to go on a huge gold grab from its citizens. Turkey is Europe’s largest gold producer. Every year since 2001 gold production has climbed, from 2t in 2001 to 33.5t in 2013. According to the World Gold Council, the Turkey’s Ministry of Energy & Natural Resources estimate gold reserves to be 840t, and resources to be as high as 6,500t. The government continues to encourage growth in the gold mining sector with well-considered incentive schemes to get mining companies up and running. Gold recycling is also well-established in the country and there is strong supply-chain. With this and it’s growing mining sector it isn’t surprising that is one of a handful of countries that has more than one LBMA accredited refinery, an excellent position to be in as the gateway between Europe, Asia and the Middle East. Whilst mined amounts may seem small compared to the likes of China, it is not be sniffed at given the potential resource and established recycling trade. Considering it’s geographical position and refineries, Turkey’s homegrown gold may well be very valuable to the country and its allies. It is not only Turkey’s rumoured plans for the gold it is bringing into the banking system and refining, that has grabbed the attention of the gold world but also its relationships and role as a conduit to other countries building up their gold reserves. In May 2012 the Turkish Statistical Institute reported that gold sales to Iran, from Turkey, had increased by over 30 times in the first quarter of the year, gold exports between the two countries had increased by nine metric tonnes; in 2011 the amount exported was just 286kg. Prior to 2012 the country had been a gold importer for 28 of the previous 31 years. It became an exporter when Iran began selling the country gas and accepted gold bullion as payment. This was, of course, done in order to circumvent international sanctions. And where does all this lead to? The ‘Axis of Gold’, as entitled by Rickards. 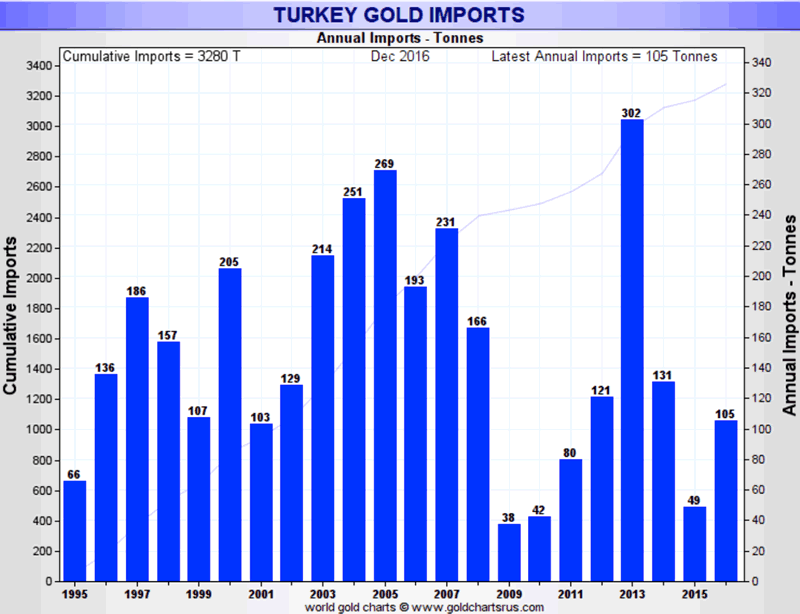 Once again, it is very important to consider Turkey’s geographical position and allies when it comes to gold demand. The move to accumulate gold in Russia is no secret, and as Putin advisor, Sergey Glazyev told Russian Insider, in April 2016, ‘The ruble is the most gold-backed currency in the world’. He added that he had made the same offer to China and Iran and his offer was found reasonable. “We have given the necessary instructions to our central banks and we will try to conduct such [trade] relationships between us through this way,” Erdogan said. Turkey may well have major issues in many areas of its economy, but it is positioning itself for the changing of the monetary guard that we are slowly witnessing around the world, and it is using gold as its insurance and safe haven in the ongoing and soon to escalate currency wars. Russia and China are poised for a weakening of the dollar and of the influence of the last superpower and indeed the potential political and financial contagion in the EU. Turkey feels aggreived and sees itself as a victim of “economic sabotage” and of dollar “hegemony” and largely ignored by the EU when it comes to the refugee crisis and growing threat of terrorism. All three countries have shown a strong affinity through gold across all levels – government, banking system and citizens. Whether you think of the Turkey in Europe or not, there is no country on the continent that is able to play all three roles of producer, conduit and accumulator of gold in the same way that Turkey can. In an increasingly multi polar world where the heavily indebted, near bankrupt U.S. economy and by extension the U.S. dollar look very vulnerable, gold is the ideal currency for those seeking to protect themselves from the coming decline of the dollar. This applies for all – for apolitical investors, for U.S. allies and especially as we have seen for the U.S.’ competitors and adversaries who are looking to operate beyond the realms of the US-dollar denominated SWIFT payments and dollar based monetary system. 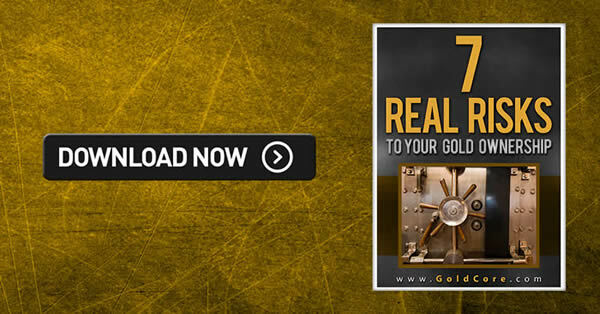 Gold is highly liquid, cannot fall victim to cyber warfare and is very difficult to steal or confiscate if owned in the safest ways – allocated and segregated gold coins and bars in the safest jurisdictions in the world. It has throughout history and in recent months shown its safe haven attributes and value as a hedge against dollar and other fiat currencies weakness and devaluation. Due to ongoing requests for higher credit and debit card transactions, we have increased our maximum card transaction sizes from 5,000 to 50,000 GBP, EUR or USD. We do not limit card payments to 50,000 per day but to 50,000 per individual transaction. This means that clients can do a number of transactions for 50,000 on a single day. Certain banks may have restrictions in this regard. In the volatile markets of today, this added liquidity is advantageous and, to our knowledge, these are the highest credit and debit card transaction limits in the bullion market. This will be attractive to investors seeking to lock in prices without having to wait for funds to clear first. Credit and debit card rates have come down significantly and are now 1.9% for credit cards and 0.45% for debit cards. Please keep in mind that this is subject to your own credit card limits.